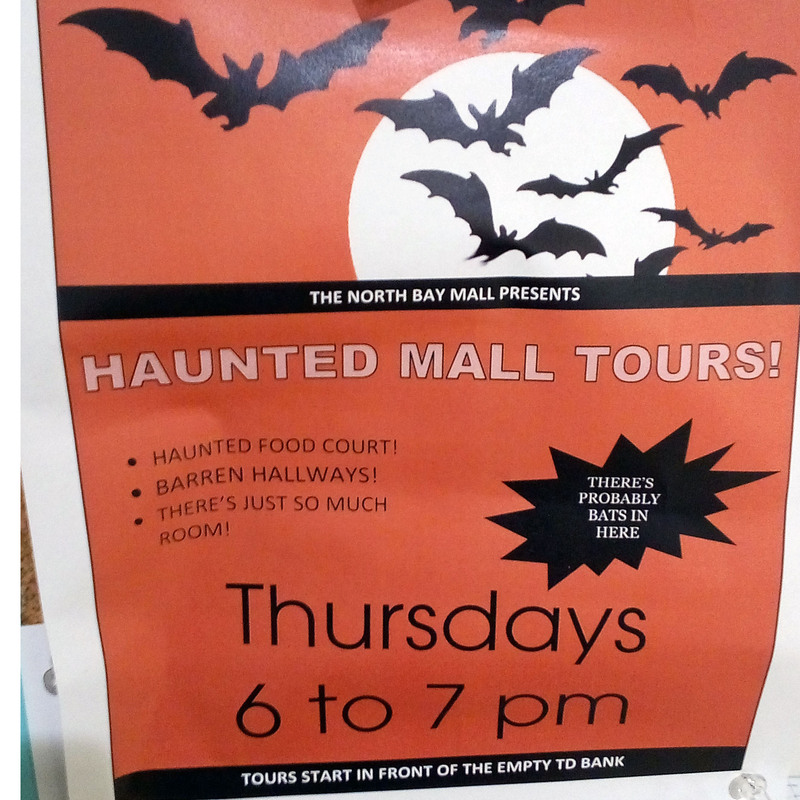 The North Bay Mall has been hosting Haunted Tours. “In the spirit of Halloween, The North Bay Mall wants to scare you with some spooky stories, horrific history, and terrifying tales from retail!” reads a news bulletin posted inside the eerily quiet mall. Fiona Prachi, the Executive Manager for the mall, reached out to The North Bay Bay about the tours. Sights included the broken, curtained off remains of a small staircase, an empty room covered in brown paper, the recently closed Source, a bedraggled looking H&R Block, a vacant Ardene’s, a closed Tan Jay, a factory outlet Stitches in danger, the unused space left behind by the Cinema Champlain, a nearly deserted food court, ill-planned Hart Store roadblock, uninhabited nail salon, and finally a long, unnecessary hallway that leads to an exit. Stopping outside the former Source store, our tour guide Tim Brioux took a moment to explain the barren business’s sordid past. Just in front of Cafe Botanica, Brioux points across the expanse between the coffee shop and Stitches. Brioux then points to the Bentley. Brioux wiggles his fingers for effect. At the end of the tour, attendees are given a five dollar gift certificate for Weight Watchers. Brioux handed out the vouchers before disappearing into the mall’s only remaining bathroom, never the be seen again. Some of the many spooky stores included on the Hunted Tour! Fiona Prachi has been getting some great reactions so far. But just how scary are the tours?